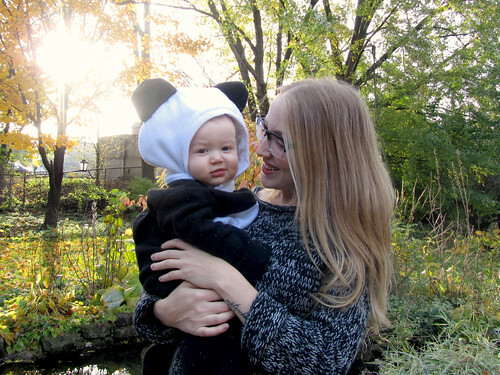 The A & B Stories: First Halloween! For Benjamin's very first Halloween, my Mom-in-law Norine wanted to make his costume for him. 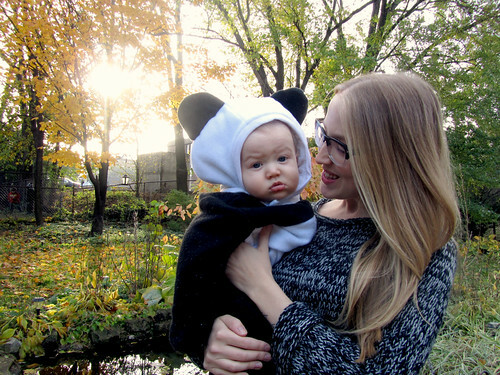 She chose a really cute Panda costume...cutest baby Panda bear ever! He sort of reacted to this the way he did his snowsuit...a little tense and very serious. I took a ton of pictures and was singing and bouncing him around to get a smile...no dice. But I still managed to get a few cute pics. Thanks so much to Norine for making such a cute costume!! Xo! Oh what a lovely wee bear.....and Mommy looks gorgeous too!! !